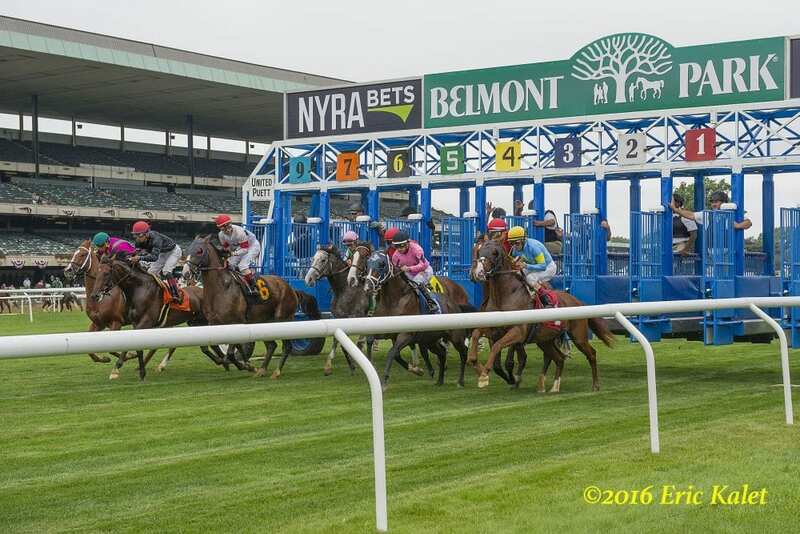 The New York Racing Association, Inc. (NYRA) today announced the stakes schedule for a 48-day Belmont Park spring/summer meet, featuring 59 total stakes races worth $18.4 million, to commence on Friday, April 26 and run through Sunday, July 7. The meet is highlighted by the three-day Belmont Stakes Racing Festival from Thursday, June 6 through Saturday, June 8 that will encompass 18 total stakes, including eight Grade 1s, featuring the 151st running of the $1.5 million Belmont Stakes on June 8. The Belmont Stakes Racing Festival opens with three stakes races on June 6, including a pair of Grade 3 turf events, the Intercontinental for older fillies and mares and the Wonder Again, for 3-year-old fillies. The next day will offer four graded stakes, led by the Grade 2, $600,000 New York for older fillies and mares going 1 ¼ miles on the turf. Belmont Stakes Day will feature nine graded stakes, including eight Grade 1s. The Grade 1, $1.2 million Runhappy Metropolitan [Dirt Mile], the Grade 1, $700,000 Ogden Phipps [Distaff] and the Grade 1, $400,000 Jaipur [Turf Sprint], recently upgraded to Grade 1 status, are “Win and You're In” qualifiers for the Breeders' Cup in November at Santa Anita. The Man o' War Racing Festival set for May 11 boasts five stakes, including four graded events, led by the Grade 1, $700,000 Man o' War at 1 3/8-miles on the turf for 4-year-olds and upward. The action-packed card is also highlighted by the Grade 3, $300,000 Peter Pan, the local prep for the Belmont Stakes, for sophomores at 1 1/8 miles. Rounding out the day's stakes are a pair of Grade 3 contests for fillies and mares with the $200,000 Beaugay at 1 1/16 miles on the grass and the $200,000 Vagrancy for sprinters, and the $150,000 Runhappy for sprinters 4-years-old and up. The spotlight will shine on New York-breds on Monday, May 27, as part of Big Apple Showcase Day. The lucrative Memorial Day card features six stakes worth $900,000 for horses bred in the Empire State led by the $200,000 Commentator at a mile for 3-year-olds and up and the $200,000 Critical Eye at the same distance for fillies and mares, 3-years-old and upward. Also featured on Big Apple Showcase Day card are a quartet of $125,000 stakes for New York-breds, including the Kingston, Mount Vernon, Mike Lee and Bouwerie. In 2019, the Stars & Stripes Racing Festival will be contested over three days beginning on Thursday, July 4 and concluding on Saturday, July 6, when five graded stakes will be offered on the Belmont spring/summer meet's penultimate day. The packed card will include the Grade 1, $1 million Belmont Derby Invitational for 3-year-olds going 1 ¼ miles on the turf and the Grade 1, $750,000 Belmont Oaks Invitational over the same surface and distance, as well as the Grade 3, $250,000 Dwyer for 3-year-olds. The docket will also include the Grade 2, $700,000 Suburban for 4-year-olds and up at 1 ¼ miles, and the renamed Grade 2, $300,000 John A. Nerud, formerly the Belmont Sprint Championship, a “Win and You're In” qualifier for the Breeders' Cup Sprint. Inducted into the Hall of Fame in 1972, Nerud, who trained such legends of the sport as Dr. Fager and Gallant Man, was a founding member of the Breeders' Cup, serving as chairman of the Breeders' Cup marketing committee in its early years. The longtime trainer, president and general manager for William L. McKnight's Tartan Farms passed away in 2015 at the age of 102. Opening Day on April 26 will kick off the meet's stakes action with the $100,000 Affirmed Success for New York-breds. The graded stakes action will commence on Saturday, May 4 with the Grade 2, $200,000 Sheepshead Bay, the Grade 3, $200,000 Westchester and the Grade 3, $150,000 Fort Marcy. Closing Day on Sunday, July 7 will bring the curtain down on the meet with the $100,000 State Dinner before the racing action moves to Saratoga Race Course for the Thursday, July 11 opening card. This entry was posted in NL List, The Biz and tagged acorn, belmont, belmont park, belmont stakes, jaipur, Just a Game, man o' war, manhattan, Met Mile, New York Racing Association, nyra, Ogden Phipps, stakes schedule, woody stephens by NYRA Press Office. Bookmark the permalink.